Sahara Star, the flagship hotel of Sahara India Pariwar, is one of India’s most desirable destinations. 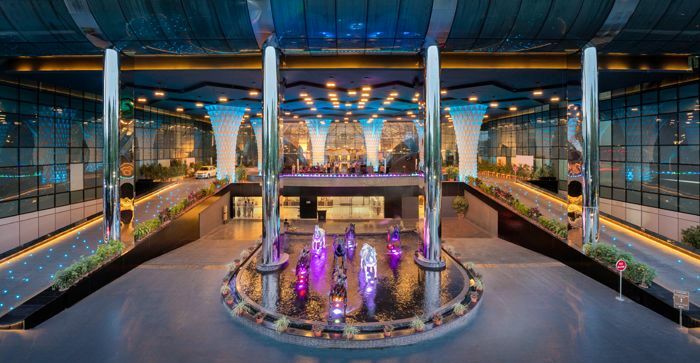 The 5-star deluxe hotel strategically located opposite Mumbai’s domestic airport magnificently blends Indian mysticism and culture, while personifying the country’s progressive spirit blending peerless hospitality with ultra-modern technology. Hotel Sahara Star promises to enthrall the world with its magnificence, an architectural phenomenon, a majestic landmark, a destination to be experienced in its entire splendor. 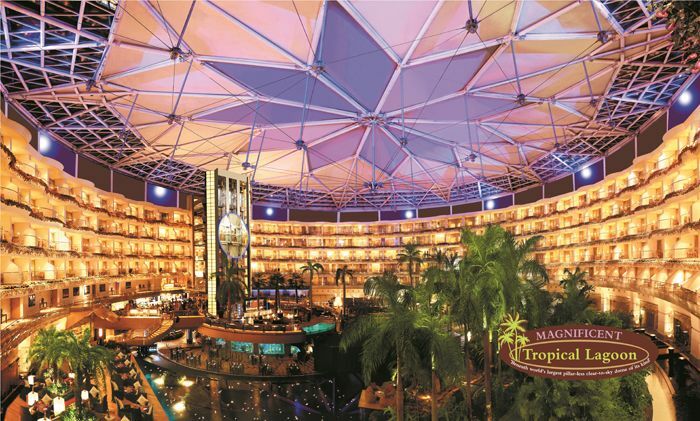 Creating a paradigm shift, Sahara Star showcases world largest-pillar-less-clear-to-sky dome, an architectural landmark blending hospitality and entertainment to cater one of the most individualized hospitality experiences. Complemented by India’s finest 4,000 sq ft Marine Aquarium, abode to world’s only Private Dining Room inside a marine aquarium exquisite marine lives, the Hotel weaves a dining facility amidst these aquatic wonders. The world’s first ‘hemisphere’ three compound-curved custom designed all glass panoramic elevators rising in the exotic 55,000 sq. ft tropical lagoon can be found nowhere else. In an ambience steeped in rich culture and superlative luxury, Sahara Sapphire, Mumbai’s largest pillar-less multi-purpose event hall, gives an opportunity for every host to announce their event to the world. Hotel Sahara Star boasts of its largest hall in the city with a floor plate of 55,000 sq.ft, an impressive ceiling height of 25ft. Besides, reigned by contemporary design, Jade Ballroom embraces a sombre play of elegance. With a capacity to host 1000 guests in its abundant space of 10,000 sq.ft. 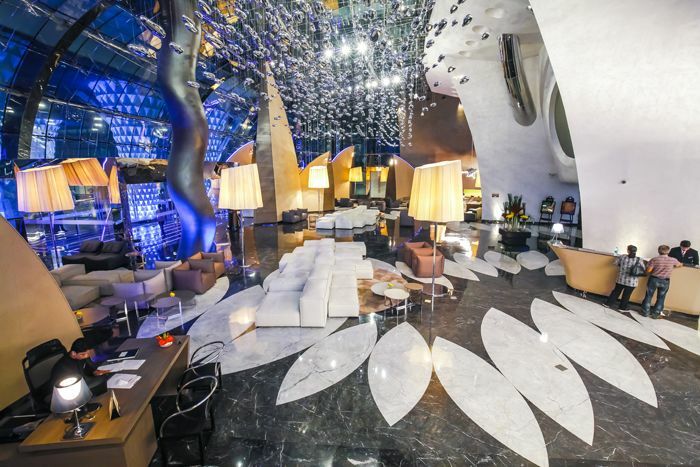 Jade’s pillar-less multi-function area with a ceiling height of 18 feet is a captivating sight for every guest. Opulence, abundance, extravagance – three things that define these extremely spacious 1327-sq. ft. regal masterpieces. Luxuriously appointed, these suites each comprising a living room, a dining room and two bedrooms, open up a whole new galaxy of indulgences for a privileged few like you. If you prefer to relax after a busy day, the well-stocked bar and the home theatre are available to give you company. If, on the other hand, you fancy a refreshing shower, just head towards the bathroom fitted with a state-of-the-art Jacuzzi, complete with a bathtub, shower cubicle with rain shower, glass partition with motorized curtains. The furnished balcony overlooking the tropical lagoon sets perfect mood for you to kick-start the day with a scrumptious breakfast or wind up with a drink or two accompanied by soothing music. When tastefully designed interiors and prudently created modern amenities come together, the result is often awe-inspiring; these city-facing suites are precisely that. Expansive and spacious, these 1200-sq. ft. suites spoil you with choices to indulge with roomy and airy living rooms, magnificent bedrooms with king-size beds besides exquisite furniture and fittings. While you lose yourself in the picturesque cityscape, you can rest assured of a memorable stay, perfected by walk-in wardrobes, impressive bathtubs, shower cubicles with rain shower and more in every suite. 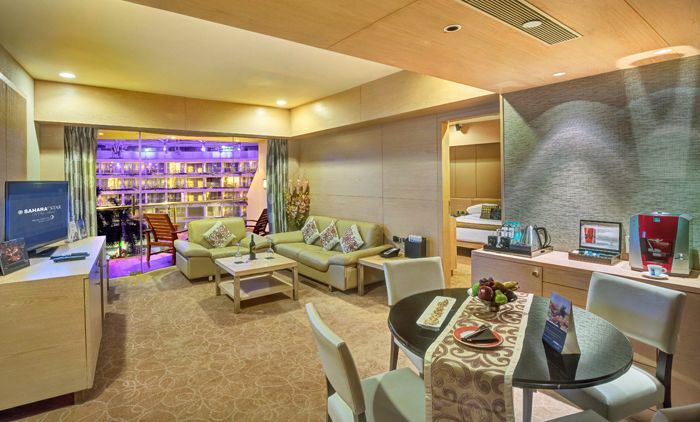 Experience the perfect blend of luxury and comfort as you step in to the Uranus Premier Suites. Spreading across 1001 sq. ft., these splendid suites welcome you to elegant living rooms thoughtfully divided into sitting and dining areas, thus creating a comfortable ambience to entertain your guests. The king-size bed in the bedroom and a capacious balcony overlooking the tropical lagoon make this an ideal choice for a relaxing evening. Extremely well-planned bathrooms with bath tubs, shower cubicles, glass partition with motorized curtains, a separate powder room in every suite take luxury to a new level. Treat your eyes to the overwhelming views of the spectacular city in all its glory from these 700-sq. ft. city-facing suites. While the well-appointed, attached living rooms are inviting enough, the king-size beds in the bedrooms take you to a different planet of pleasure. Besides boasting a choice of ambient lighting and media hub, every Uranus Suite comes equipped with a bath tub and a separate shower cubicle. What’s more, the motorized curtains that open to a sky view roof reveal the panoramic view of the city through the double-glazed glass walls. Looking to indulge in unlimited luxury? Experience Venus Suites to pamper yourself with endless indulgences. The massive 1100 Sq. 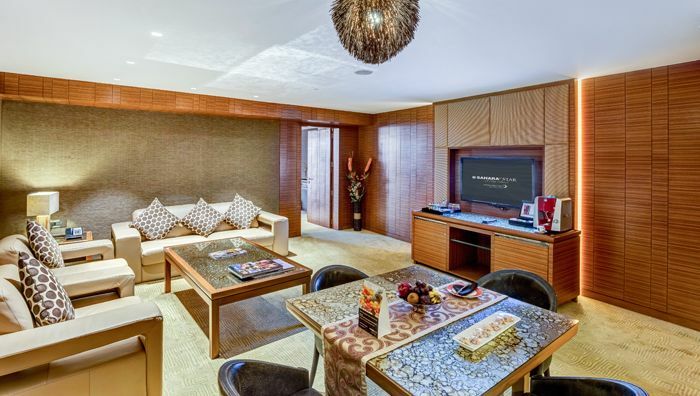 Ft. suite hosts exclusive features paired with unmatched hospitality. Be in company of stars with an open-to-sky glass roof for a romantic rendezvous. There’s more! While reclined on leisure, get into ultimate luxury with the wet deck that offers a panoramic view of the city. Relax and unwind to get an incredible experience. Luxury multiplies with suites that are two-bay, which include a lavish living room & attached bedroom. Relax and unwind with king sized beds, bathtubs, and separate shower cubicles in each bathroom. Special spa beds add to your leisure and the exquisite interiors fittings and fixtures give you the impression of ultimate luxury. Here’s a good time waiting for someone special. You. The stunning 550 Sq. 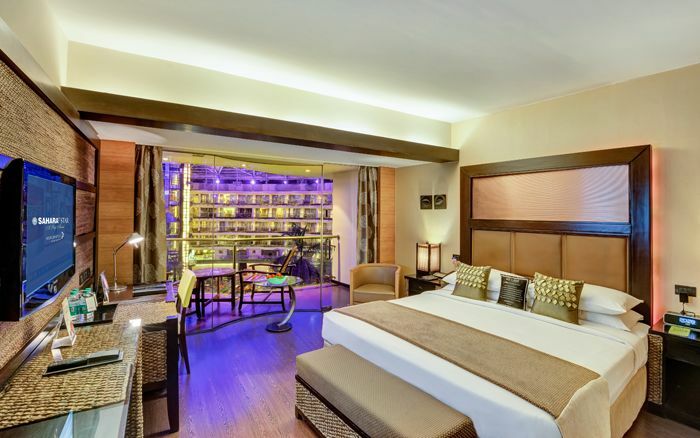 Ft. Venus rooms are designed to offer you unbending luxury with unparalleled hospitality. Have stars as your companion with an open-to-sky glass roof for a romantic rendezvous there’s more! While reclined on leisure, get into ultimate luxury with the wet deck that offers a stunning view of the city. Relax and unwind to get an incredible experience. Rest in your lavish living room and experience peacefulness with king sized beds. Exclusivity continues with exquisite bathtubs, and separate cubicles in each bathroom. The interiors having high-quality fittings and fixtures to give you an experience wrapped with luxury. 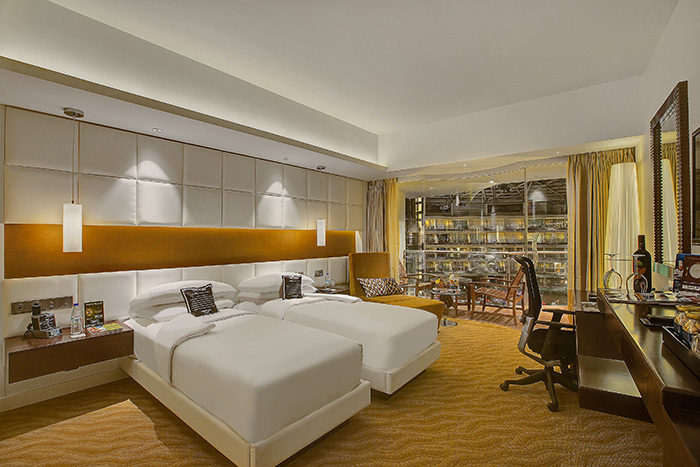 A haven of luxury & comfort, the Mercury guest rooms are contemporary in design. 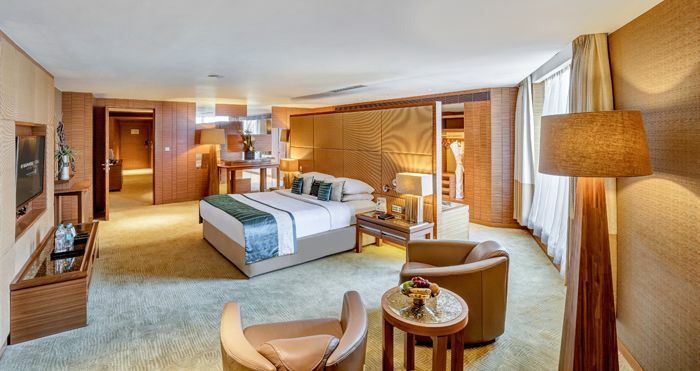 With a king size bed, choice of ambient lighting & elegant interiors, this room features an exquisite bathroom & elegant interiors with a spacious balcony to indulge in the serene view of tropical lagoon. Sweeping the views of the rapturous city from its double glazed glass walls, Mercury city facing guestrooms invites you to step into an experience that is unmistakably majestic. With a king-size bed, stylish furnishing and pristine marble bathrooms, the rooms offer an ensemble of relaxing comforts for business as well as other travel enthusiasts. With its motorized curtains that open to a sky view roof, its panoramic view of the city from the double glazed glass walls are a retreat to soothe frazzled minds. Outfitted with a separate shower cubicle, a motorized curtain that folds to a clear sky view roof and other signature offerings, Mercury City Facing Rooms revives the stay experience to become a partner of your choice inadvertently. Overlooking the tropical lagoon, this guest room is furnished with either a king-size bed or twin beds. This room opens to a balcony where the guest can enjoy a relaxing evening & a spectacular view. Flavours that tantalize the senses. Moments that creates an album of memories. Experiences that add to life’s memoirs. 9 food & beverage destinations with 4 unique concepts, 1 inimitable journey. We have an array of secret recipes for the thirsty traveler, the Bon Vivant, the young & the restless, the bold & the beautiful and the corporate citizen too. 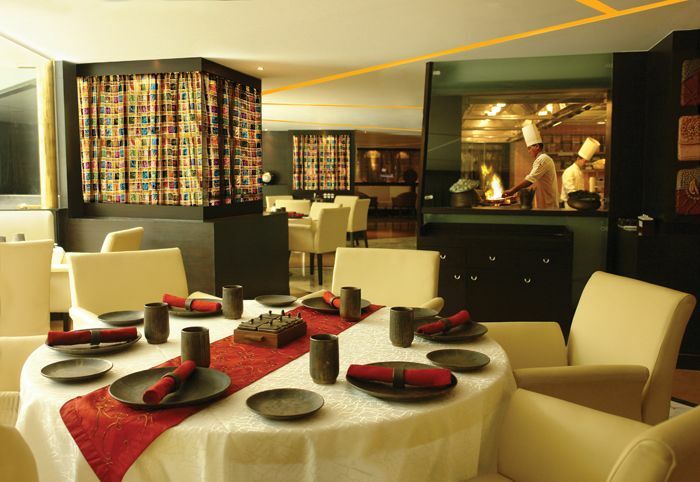 The hotel brings together a sumptuous array of delicacies from across the globe. Come experience this culinary journey! The Earth Plate – Global cuisine restaurant takes you on a gastronomical journey with a variety of international delicacies to tickle every taste bud. 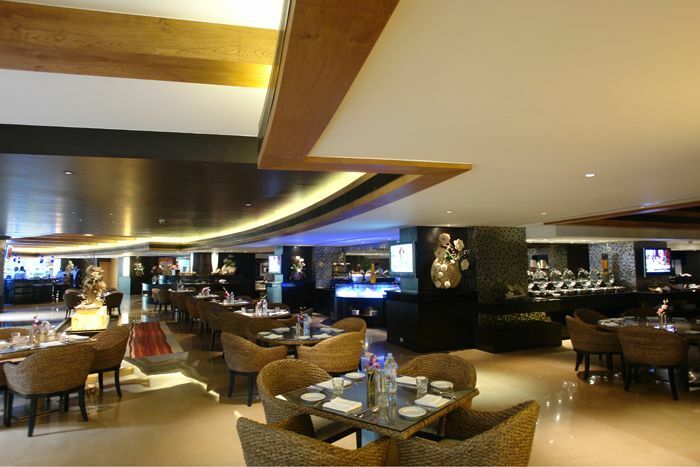 The opulent interiors with modern patterns and design, offers a casual as well as an elegant dining option. Namak – the Indian Specialty restaurant exudes the contemporary food, super luxe ambience which takes the discerning taste buds on a delectable treat. With a menu reminiscent of the Royal Kitchens of India, the culinary delights on offer create magic with fragrant spices conjuring up a meal fit for a king. 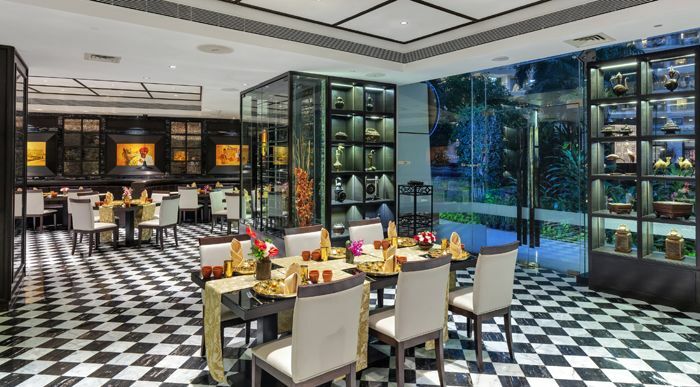 East Asian Spice Trail abbreviated as EAST offer aficionados a rich experience of Pan Asian cuisine in an ambiance resembling the culture of Asia. EAST is designed to give you an authentic experience, its live stations and tepanyaki grills recreate the splendor of Asian cuisine. Savor the mysteries of Asia from China, Thailand, Japan & other parts of South Asia as the restaurant will embark you on a journey that has a high degree of homogeneity and authenticity. 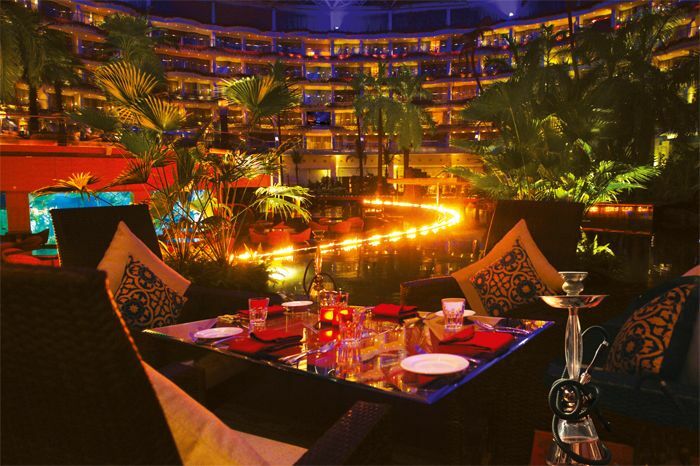 Mabruk – The Mediterranean, Winner of Best Lebanese Restaurant 8 Consecutive Years, by Times Food Award sets the mood with its casual low seating on a wooden deck and a spectacular view of the pillar less clear-to-the sky dome. Combining the sophistication and subtleties of Mediterranean cuisines with the exotic ingredients of the Middle and Far East. Manuhaar – The Taste of Tradition, A perfect melange of the Gujarat and Marwad delicacies served in a single thali. Inspired by the simplicity of the people from the soil, the interiors reflect the subtle taste of cultural authenticity. Cherish the gourmet delights of the two states with the aromatic essence to soothe the craving for your soul food. The Lagoon Lounge, set against a tropical backdrop, it features an exquisite range of tea & coffee complemented by delectable Indian & Western savories. The Bakery Shop features scrumptious desserts, savories and a selection of homemade breads, is an ideal venue for a quick snack on the go or for that perfect cake for a grand occasion. Diwine – the Wine Cellar is the largest wine bank in the city, houses the finest wines from across the globe. A haven for all wine sommeliers the menu offers exotic cheese and other delicacies. Ocean – The Private Dining Room – The world’s only Private Dining Room amidst India’s largest marine aquarium, is a unique space covered by an aquarium on three sides. The PDR is ideal for private dinners and soirees as well as special celebrations. Dine in complete tranquility while being attended to by your personal butlers and being assured that your privacy is secured courtesy the dedicated security personnel. Be it seminars, workshops, conferences or grand celebrations, Sahara Star’s banquets is an ideal choice. The exclusive Business Centre serves as the ideal destination for business deals. Five meeting rooms christened as Clubs, Spade, Hearts, Diamonds, and Kings offers the state of the art audio visual facility, live broadcast and tele-video conferencing facilities, with high speed Wi Fi internet connectivity and secretarial services at easy access. Juvana Spa and is Sahara Star’s distinctive spa and wellness property. Its heavenly space and experienced hands knead stress out of your body and takes you closer to self. 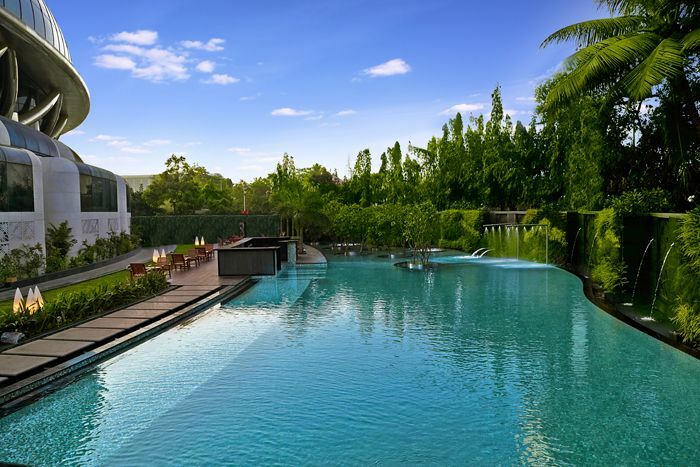 A plush swimming pool with a built in Jacuzzi to experience ultimate leisure and a well-equipped fitness centre to further enrich your rejuvenation experience. The Vision transforms into reality, Sahara Star promises to enthrall the world with its magnificent, an architectural phenomenon, a majestic landmark, a destination to be experienced in its entire splendor. Sahara star will bring to life another first-of-its-kind in the hospitality industry.